How should a blogger go about shopping for someone to give her blog a makeover? What should she look for in a designer? How much should she expect to pay? The best way to shop for a blog makeover is to blog surf - by that I mean go to one of your favorite blogs - then start clicking on the links to their favorite blogs and so on - once you find a design you like you'll more than likely be able to track down the designer as they usually post some sort of "calling card" on the blog either in the sidebar or at the bottom of the blog. Another way to shop for a designer is a good old fashion Google search for custom blog design, or hip blog design, or trendy blog design - this should result in a few good designers to peruse. When comparing designers - definitely check out the portfolios - a good designer should have a constant feel to his/her designs - but you should be able to see different personalities in each of the blogs he/she designs - this way you will know that he/she is willing to work with you to get a look you will be happy with and not just a cookie cutter design that only the designer is happy with. Custom designs definitely range in prices - most go for around $50-$100. 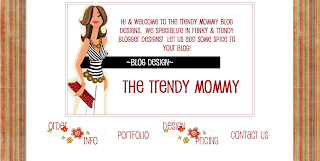 That's where TrendyMommy Blog Designs is unique - I'm a SAHM who thinks it's fun to design something new for each and every one of my clients - and I work until they love their design - since I don't have much overhead and I really enjoy doing this and the praise I receive when someone sees their design, I'm able to offer more reasonable fees. You can get a two-sidebar custom design for $33 - can't beat that! Several readers have talked about wanting to avoid "clutter" on their blogs. What makes a blog look cluttered, and what can bloggers do to give their blogs a more reader-friendly feel? Oh yes, the dreaded clutter - A cluttered blog detracts from your site and readers don't want to stick around a site they feel is cluttered. The main goal of most bloggers is to write content - information that others will be attracted to. With that being said - the eye should be able to find that content easily - a cluttered blog distracts readers from what they came to your site for. Now I'm not saying that the occasional ad is bad - I have ads running on one of my other blogs - www.thetrendymommy.blogspot.com - but it's on the side and doesn't take away from the main jest of the blog. In my opinion - and others may differ - but when I open a blog that has Google ads at the top or bottom of each post - I run - and run fast - too much clutter, not worth dealing with it. Also, a lot of animated blinking garb in the header is considered clutter by many and is also distracting to readers - once again a sidebar would be a more appropriate place for this. Although you want to steer away from crazy color schemes and vertical lines that make others nauseous - don't take all the fun out of a blog design. Some people want all white - background, posting area, header, sidebars - to me this is just as unappealing as the cluttered blog. You have to strike a balance. Navigation bars at the top under the header are useful as are expandable links instead of a blogroll of 500 or a never ending archive of past posts. If you could offer a new blogger just three design tips, what would they be? 1. Make it clean - but appealing. 2. Make the design speak for your blog - in other words the design should emphasize what your blogging about - help the reader determine what you're all about in seconds - a well designed header is very helpful in doing this - creating a fun graphic image, a good blog title, and tagline are key.